Review: I figured since it took me so long to read the last Sookie book that I would just jump right into the latest while I still was in the groove. I liked this one much better than the last one. There was more action, more drama and more mystery. I'm still not sure what she is doing to Sookie and Eric because their relationship is not following how it used to be, Eric's character seems to be acting out of character but maybe thats the point. He is under stress...if vampires get stressed with the King in town and everything else that is going on that he doesn't like to divulge to Sookie. Yet he still seems a bit off. This book also flowed better the story lines converged better and it didn't seems as stunted as the last one. I know a lot of people were disappointed with this book as well but I just didn't feel that way. 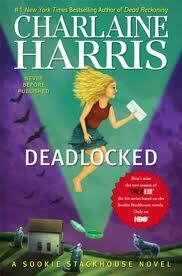 I actually found it entertaining and I liked where she took it with the exception of Sookie and Eric. I'm still finding it hard to separate the TV show True Blood from the books sometimes, like when Tara had her babies and they were all pink - I was thinking uhm Tara is African American...then I remembered she is Caucasian in the book. I have the same trouble with separating the books and tv show. I always get confused about Tara, too. I do like how the book explores Sookie's ancestry more than the show does. I agree that Sookie and Eric's relationship is in a weird spot. Guess I'll have to wait for the next book to see what's going on there!